Boys of the Vikings Gra-Y Club receive an American flag flown over the United States Capitol through Commodore Perry Post 525 of the American Legion contact, from Wesley P. Gregory, administrative aide to Representative Gordon L. McDonough, at the Centenary Methodist Church in Little Tokyo, Los Angeles, California, February 6, 1962. 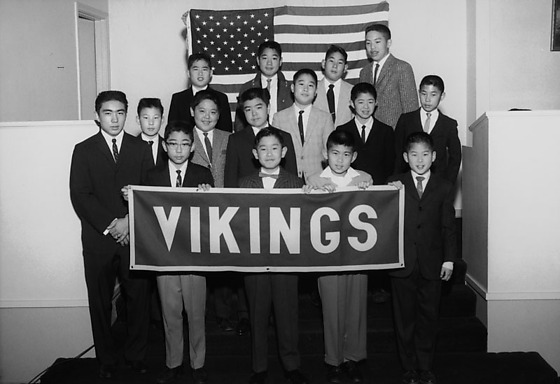 1P and 2N: Portrait of three rows of fifteen boys in suits holding a sign, "Vikings", with American flag in background; past president Danny Uematsu, far right second row, and incoming president Andy Suzuki, far right third row. 3N: Uematsu and Suzuki hold corners of American flag with smiling McDonough standing between two Japanese American and a boy behind the flag. The Vikings Gra-Y Club would meet at Centenary Methodist Church in Little Tokyo, Los Angeles, California. Typed on original negative envelope: Centenary Methodist Church -- Vikings Club.